Many hunter-gatherer groups employed various methods of drying to preserve meats. Drying also increases significantly the protein content of meats; this is the case with dried mussels. I discussed this effect of drying before here with respect to small fish (). 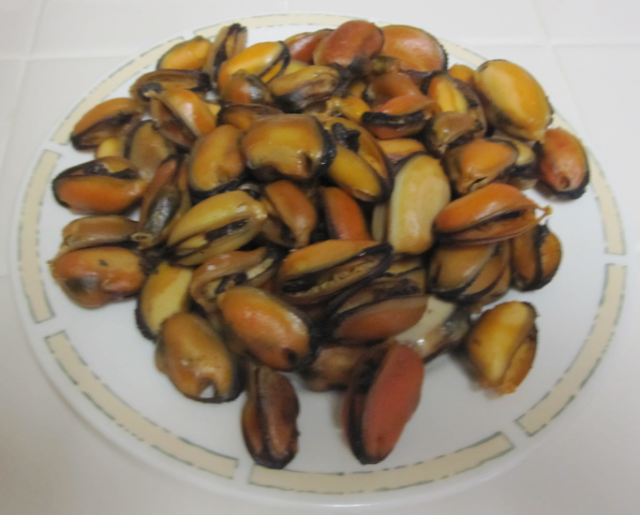 The photo below is of a plate with about 240 g of dried mussels that I prepared using the simple recipe below. To prepare your mussels as in the photo above, you will have to steam and then dry them. You can season the mussels after you steam them, but I rarely season mine. Almost none of the food I eat requires much seasoning anyway, because I use nature’s super-spice, which makes everything that has a high nutrient content taste delicious: hunger (). - Steam the mussels for about 10 minutes, or until all are open. - Remove the mussels from the shells; carefully, to avoid small shell pieces from coming off into the mussels (they are not kind to your teeth). - Preheat the oven to about 200 degrees Fahrenheit, and place the mussels in it (on a tray) for about 1 hour. - Leave the mussels in the oven until they are cold, this will dry them further. About 240 g of mussels, after drying, will yield a meal with a bit more than 160 g of protein – i.e., the proportion of protein will go from about 20 percent up to about 67 percent. In this case, most of the calories in the meal will come from the protein, if you had nothing else with it, adding up to less than 800 calories. This comes in handy if you need to have lunch out, as the dried mussels can be carried in a plastic bag or container and eaten cold or after a light re-heating in a microwave. To me, they taste very good either way; but then again anything that is nutritious tends to taste very good when you are hungry, and I rarely have breakfast. I often eat them with pre-cooked sweet potato, which I eat with the skin (it tastes like candy). You may want to think of dried mussels prepared in this way as a protein supplement, but a very nutritious one. You will be getting a large dose of omega-3 fats (3.11 g) with less omega-6 fats than you usually get through fish oil softgels (where n-6s are added for stability), about 1,224 percent of the recommended daily value (RDV) of magnesium, 461 percent of the RDV of selenium, 1,440 of the RDV of vitamin B12, a large dose of zinc, and (interestingly) almost 100 percent of the RDV of vitamin C.
Since mussels are very low in the food chain, accumulation of compounds that can be toxic to humans is not amplified by biomagnification (). But, still, mussels can be significantly affected by contaminants (e.g., petroleum hydrocarbons), so sourcing is important. The supermarket chain I use here in Texas, HEB, claims to do very careful sourcing. Telltale signs of contamination are developmental problems such as thin shells that shatter easily and stunted growth (). For those readers who are on a low-carbohydrate diet, please pay attention to this: there is NO WAY your body will turn protein into fat if you are on a low-carbohydrate diet, unless you have a serious metabolic disorder (see this post: , and this podcast: ). And I mean SERIOUS; probably way beyond prediabetes. Do not believe the nonsense that has been circulating in some areas of the blogosphere lately. A high-protein low-carbohydrate diet is one of the most effective diets at reducing body fat, particularly if you do resistance exercise (and you do not have to do it like a bodybuilder). That is not to say that a high-fat low-protein diet (like the "optimal diet") is a bad idea; in fact, the optimal diet is a good option if you do not do resistance exercise, but that is a topic for a different post. 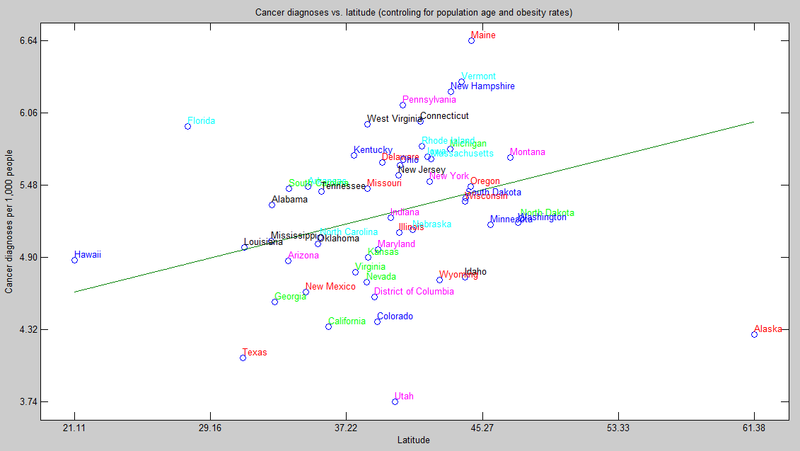 In the comments section of my previous post on cancer rates in the US states () my friend Aaron Blaisdell noted that: …comparing states that are roughly comparable in terms of number of seniors per 1000 individuals, latitude appears to have the largest effect on rates of cancer. Good point, so I collected data on the latitudes of US states, built a more complex model (with several multivariate controls), and analyzed it with WarpPLS 4.0 (). 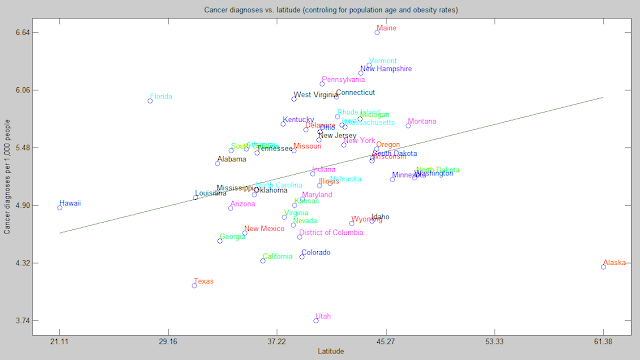 The coefficient of association for the effect of latitude on cancer rates (path coefficient) turned out to be 0.35. Its P value was lower than 0.001, meaning that the probability that this is a false positive is less than a tenth of a percent, or that we can be 99.9 percent confident that this is not a false positive. This was calculated controlling for the: (a) proportion of seniors in the population (population age); (b) proportion of obese individuals in the population (obesity rates); and (c) the possible moderating effect of latitude on the effect of population age on cancer rates. The graph below shows this multivariate-adjusted association. What is cool about a multivariate analysis is that you can control for certain effects. For example, since we are controlling for proportion of seniors in the population (population age), the fact that we have a state with a very low proportion of seniors (Alaska) does not tilt the effect toward that outlier as much as it would if we had not controlled for the proportion of seniors. This is a mathematical property that is difficult to grasp, but that makes multivariate adjustment such a powerful technique. I should note that the 99.9 percent confidence mentioned above refers to the coefficient of association. That is, we are quite confident that the coefficient of association is not zero; that is it. The P value does not support the hypothesized direction of causality (latitude -> cancer) or exclude the possibility of a major confounder causing the effect. Nonetheless, among the newest features of WarpPLS 4.0 (still a beta version) are several causality assessment coefficients: path-correlation signs, R-squared contributions, path-correlation ratios, path-correlation differences, Warp2 bivariate causal direction ratios, Warp2 bivariate causal direction differences, Warp3 bivariate causal direction ratios, and Warp3 bivariate causal direction differences. Without going into a lot of technical detail, which you can get from the User Manual () without even having to install the software, I can tell you that all of these causality assessment coefficients support the hypothesized direction of causality. Also, while we cannot exclude the possibility of a major confounder causing the effect, we included two possible confounders in the analysis and controlled for their effects. They were the proportion of seniors in the population (population age) and the proportion of obese individuals in the population (obesity rates). Having said all of the above, I should also say that the effect is similar in magnitude to the effect of population age on cancer rates, which I discussed in the previous post linked above. That is, it is not the type of effect that would be clearly noticeable in a person’s normal life. We do know that our body naturally produces as much as 10,000 IU of vitamin D based on a few minutes of sun exposure when the sun is high (). Getting that much vitamin D from dietary sources is very difficult, even after “fortification”.